Restaurant365 customers that are using a non-Cloud-based POS system have the ability to manually re-import Daily Sales Summary (DSS) files. 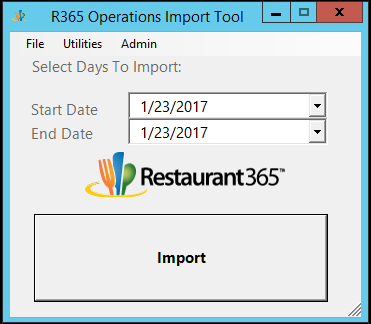 For all non Cloud-based POS systems, a user can perform the manual re-import by accessing the R365 Operation Import Tool installed on the Back Office Computer of the Restaurant Location. This is the same Computer that was accessed by the Restaurant365 POS Integration team during the POS Integration. Depending upon the internet connection speed and how many transactions occurred at the Restaurant Location for this date range, the import may take between 1 and 5 minutes to complete. A progress bar will appear while the import process is taking place. The import tool will close itself automatically when the import is complete.